iOS 9 beta has been released for several weeks and some testers have found that people who own iPhone 6 or iPhone 6 Plus can access access non-default credit, debit and loyalty cards in their Apple Pay Wallet directly from the lock screen with just two taps of the home button, according to AppleInsider. 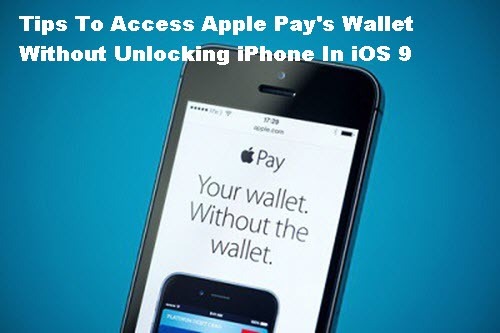 Apple’s iOS 9 will not only carry over these same automated payment functions, but add in the convenience of selecting from any number of provisioned cards without unlocking iPhone and opening the Wallet app. To turn on lock screen Wallet access, open Settings and navigate to Touch ID & Passcode. After entering your device passcode, scroll down to the menu subsection titled Allow Access When Locked:and toggle Wallet to the on position. The feature will come in handy later this year when companies like Kohl’s and JCPenney throw in support for special store cards. Apple Pay access to loyalty and member cards will also be available for select retailers. This entry was posted in iOS 9, Tips and Tricks and tagged ios 9 new features, tips for ios 9 by IosdroneD. Bookmark the permalink.